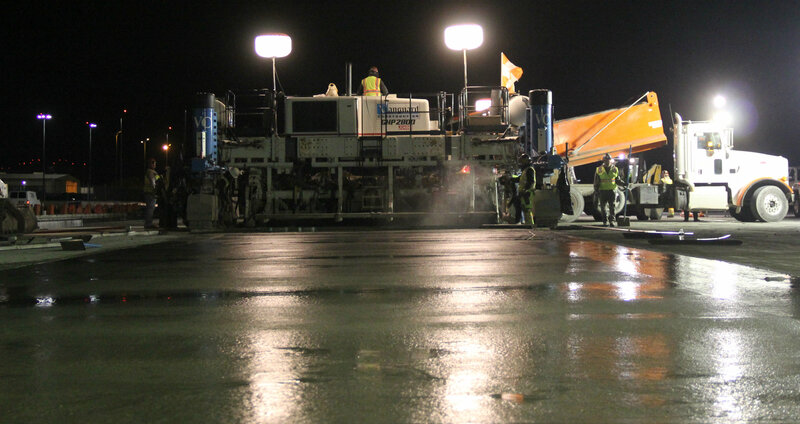 SAN JOSE – Mineta San Jose International Airport is using sustainable concrete from Graniterock, made with industrial byproducts, to significantly reduce the carbon impact of its $58 million Terminal B expansion project. The fastest-growing airport in the country, in terms of both passengers and airlines, is building a five-gate interim facility connected to the south end of Terminal B to help meet demand and reduce delays. Graniterock’s work on the interim facility includes reconstructing the southeast cargo ramps with more than 42,000 yards of concrete made with supplemental cementitious materials, slag and fly ash, resulting in remarkable CO2 savings and reduced cement use by more than 10,000 tons. "This project serves as yet another example of the increasing demand for sustainable construction materials and Graniterock's ability to deliver," said Max Morgan, sales representative. "The concrete market has shifted in this direction, and we're proud to be leaders in providing high quality green concrete." Graniterock teamed up with Vanguard Construction for placing the low slump concrete with a specialized concrete paving machine. The mix designed called for replacing a portion of Portland cement with 20 percent fly ash, which was used for the first phase. The Graniterock team has pushed to use 30 percent slag replacement on the preceding phases, demonstrating the airport’s commitment to sustainable, energy-efficient construction practices. Ramp reconstruction will allow for ground boarding of aircraft as the 28 gates in Terminal B are at maximum capacity during peak times and extending the apron to accommodate up to 10 additional gates at the next phase of terminal development. The interim gates facility is a design-build collaboration between Hensel Phelps Construction and Fentress Architects.